Srinagar, Nov 09 (KNS): Reacting to the remarks of National Conference (NC) president Farooq Abdullah, in which he called for "Ireland -Type of Kashmir Settlement”, Tehreek-e-Hurriyat Chairman, Mohd Ashraf Sehrai has said that Kashmiris have not sacrificed tens of thousands of lives for a “so-called fragile, absurd and ridiculous roadmaps like autonomy, self rule, four-point formula, status quo or soft borders for resolving Kashmir. “They are barefaced, follow their treacherous politics and are never ashamed of their absurd statements but people of Kashmir are fully aware of his character and the level to which he can stoop down for his lust of power,” he said. 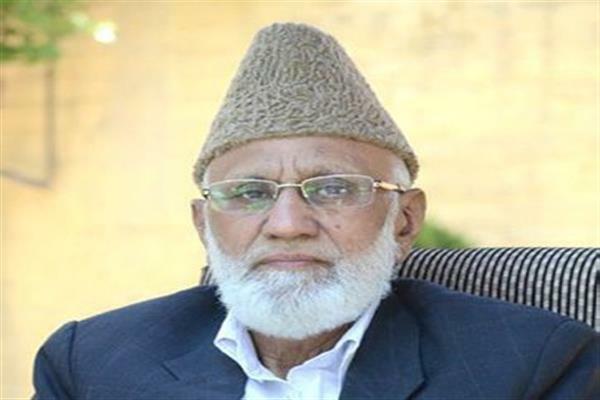 Sehrai said that all pro-India parties are responsible for miseries and bloodbath of Kashmiris. “Going through the history, one can come cross a long list of these traitors with their horrifying crimes and brutalities against their own people right from the Sheikh Abdullah who symbolized the betrayal and treachery infact the protagonist around whom the whole novel of death and destruction centered,” he said. “They have brutally and mercilessly crushed the peaceful and public uprisings of 2008, 2010 and 2016 and inflicted deep wounds on the people of Kashmir. Be it the hanging of Maqbool Bhatt or the hanging of Afzal Guru, NC was the co-signatory to both these travesties of justice. NC has at every crucial juncture deceived the people of Kashmir. "This pro-India class has mutually agreed to take turns to slaughter and to crush Kashmiris for their lust of power,” he added.